I have spent over 20 years in the music industry as a recording engineer, producer, and journalist, but primarily as a DJ. 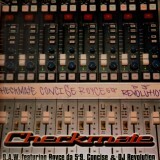 In 2002, I produced Checkmate’s “R.A.W.” featuring Concise the Black Knight, Royce the 5’9, and DJ Revolution. The song was nominated for Rap Recording of the Year at the 2003 Juno Awards (Canada’s Annual Music Awards).